Ok guys, I know I have been saying it for a while but this time it is official. 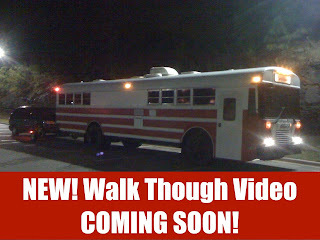 We are currently in the works of filming a full feature video walkthrough of the Good News Bus. If there is anything in particular that you would like to see featured in the video please post in the comment section and let us know. I purchased a used 1994 U-Haul truck and cut a hole in the top to install a crank up vent with a fan. Inselated the roof, installed some solar panels, an electrical cooler, propane gas grill. My bed I built to stand 4 feet giving plenty of storage space for my RV batteries. I've done a few things so that I can't be locked inside while I'm in the back and the door can't be lifted while inside. Having no windows it can't be broken into. It's easy to park and spend a few days at the beach or while visiting friends and family. In San Diego you can no longer park your RV in your driveway or on the streets. Would love to see the bathroom! But would also love to know how you came to that design,,who designed it, who did the work etc. I love to look at Rv campers and buses, as a hobby, and want to get ideas for one in the future. I will cover all of that in the video. Thanks for your suggestions! What were your final costs in refurbishing this bus? Looks GREAT! @Ron....Thanks! We have estimated a total cost of $25-30,000. Really great job! You did not mention any work on the basic bus; engine, brakes, etc. Could you cover that in the new video, please. What about the engine? On this old bus, did you have to rebuild the engine too???? I wonder about the engine also since it is an old bus and you put sooo much money into it. I guess if you can spend $30,000 remodeling it, replacing mechanical parts aren't a concern? Nice ride! The engine in our bus is an International DT-466. It is considered one of International's bullet proof engines. It only has about 115,000 miles on it. These engines easily should go 500,000 miles before a rebuild is required. 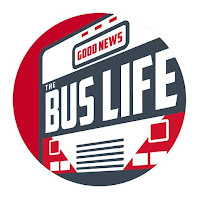 Lets hope that is the case with the Good News Bus.